Chanel S.A., commonly known as "Chanel", is a Parisian fashion house founded by the late couturier Gabrielle "Coco" Chanel, recognized as one of the most established in haute couture, specializing in luxury goods (haute couture, ready-to-wear, handbags, perfumery, and cosmetics among others). According to Forbes, the privately held House of Chanel is jointly owned by Alain Wertheimer and Gerard Wertheimer who are the great-grandsons of the early (1924) Chanel partner Pierre Wertheimer. Gabrielle "Coco" Chanel heralded new designs and revolutionized the fashion industry by going "back to basics", incorporating elegance, class, and originality. Under her tight reign from 1909ï¿½1971, Coco Chanel held the title as 'Chief Designer' until her death on January 10, 1971. In 1909, Gabrielle Chanel opened a shop on the ground floor of Balsan's apartment in Paris, which was a meeting place of the hunting elite of France. The gentlemen brought their fashionable mistresses along to the apartment which gave Coco the opportunity to sell her decorated hats to the women. Arthur 'Boy' Capel who was in a relationship with Coco saw a businesswoman in her and helped her acquire a location at 31 Rue Cambon in Paris by 1910. 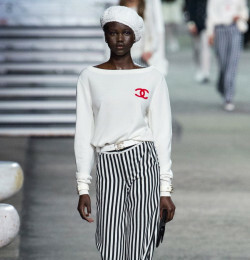 In 1913, Chanel introduced women's sportswear at her new boutique in Deauville and Biarritz, France. During World War I, Coco opened another larger shop on Rue Cambon in front of the Hï¿½tel Ritz Paris. 1921 saw the introduction of her first perfume Chanel No. 5. Earnest Beaux created the fragrance for Coco and she named it after her lucky number 5. The fragrance was a success. Parfums Chanel was founded in 1924 by Pierre Wertheimer to produce and sell perfumes and beauty products. Theophile Bader (founder of the successful French department store Galeries Lafayette) introduced Coco to Wertheimer. Wertheimer retained 70% of Parfums Chanel, while Bader retained 20%, and Coco a modest 10%. Coco was forced to operate her couture business apart from Parfums Chanel. In 1924, Coco also introduced her first costume jewelry which was a pair of pearl earrings, one black, one white. Along with the success of her haute couture business, Coco expanded her "social desirability and her personal legend." A new love interest in her life was the Duke of Westminster. 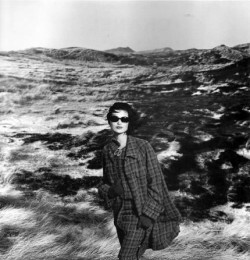 She introduced her signature cardigan jacket in 1925 and in 1926, the ï¿½little black dress,' and a tweed, inspired by visits to Scotland. Soon, Coco operated a boutique near the Louvre. As the couture Chanel and Parfums Chanel gained success, business relations between Coco and Pierre were sour. She resented the partnership with Pierre Wertheimer and believed she deserved more than 10% of the profits, and believed that the Wertheimers were exploiting her talents for their own personal gain. 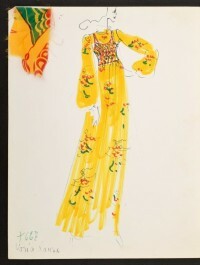 Coco designed a line for petite women in 1937. Throughout the 1930s, Elsa Schiaparelli was competing more strongly with the House of Chanel, but this was only a short term rivalry. Chanel premiered an exhibition of jewelry in 1932 dedicated to the diamond. When World War II began in 1939, Coco Chanel retired and moved into the Hï¿½tel Ritz Paris with her new beau, Nazi officer Hans Gunther von Dincklage. Only her parfums and accessories were sold in her existing boutiques. During World War II Pierre Wertheimer and his family fled to the United States in 1940, and before Coco could take control of Parfums Chanel, Wertheimer made an "Aryan proxy" for the company. Coco Chanel fled to Switzerland at this time, where she out of spite created her own collection of perfumes. Wertheimer felt his legal rights were infringed, but he wanted to avoid a legal battle and settled with Coco by giving her $400,000 USD, 2% royalty from all Chanel products, and gave her limited rights to sell her own perfumes in Switzerland. Coco stopped making perfumes after the agreement. She sold the complete rights to her name to the Wertheimers for Perfumes Chanel, in exchange for a monthly stipend. The stipend supported her and her friend, von Dincklage. Chanel returned to Paris in 1953 and became competitive again would necessarily come at a great price; Chanel needed to be a significant presence in: haute couture, pret-a-porter, costume jewelry and fragrance. Coco swallowed her pride and re-approached Pierre for business advice and financial backing. In return, he negotiated for himself complete rights to all products bearing the brand: "Chanel." Importantly for the brand and starting in 1953, Coco collaborated with jeweler Robert Goossens to design a line of Chanel jewelry which exquisitely complimented her iconic fashion designs. She also introduced the Chanel gold or metallic chain-strapped and quilted leather handbags in February 1955. Her first venture into men's fragrance, Chanel's eau de toilette for men, Pour Monsieur became endured and remains even today the number one selling men's fragrance. Pierre bought Bader's 20% share of the perfume business, giving his family 90%. Pierre's son Jacques Wertheimer took his father's place in 1965. Gabrielle "Coco" Chanel died on January 10, 1971 at the age of 87. She was still "designing, still working" at the time of her death. After her death, leadership of the company was handed down to Yvonne Dudel, Jean Cazaubon and Philippe Guibourge. The House continued average success, and Jacques Wetheimer bought the entire House of Chanel. In 1974, the House of Chanel launched Cristalle eau de toilette, which was designed when Coco Chanel was alive. 1978 saw the launch of the first non-couture, prï¿½t-ï¿½-porter line and worldwide distribution of accessories. Alain Wertheimer, Jacque's son, took over in 1974. 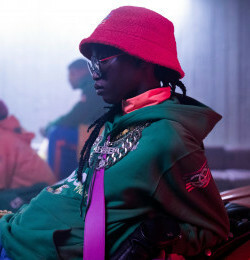 Looking for a designer who could bring the label to new heights, he persuaded Karl Lagerfeld to end his contract with fashion house Chloï¿½ and in 1983 Lagerfeld took over as chief designer for Chanel. He changed Chanel's fashion lines from the old lines to shorter cuts and eye capturing designs. During the 1980s, more than 40 Chanel boutiques were opened up worldwide. By the end of the 1980s, these boutiques sold goods ranging from US$200-per-ounce perfume, US$225 ballerina slippers to US$11,000 dresses and US$2,000 leather handbags. Rights to Chanel cosmetics and fragrances were held by Chanel only and not shared with other beauty producers and distributors. The launch of a new fragrance in honor of the late Coco Chanel, Coco, in 1984 maintained success in the perfumery business with Chanel. In 1986, the House of Chanel struck a deal with watchmakers and in 1987, the first Chanel watch made its debut. By the end of the decade, Alain moved the offices to New York City. The company earned the place as a global leader in fragrance maker and marketing in the 1990s. Heavy marketing investment increased revenue. The success of the Maison de Chanel brought the Wertheimer family fortune to $5 billion USD. Product lines such as watches (retailing for as much as $7,000 USD), shoes, high-end clothes, cosmetics and accessories were expanded. Sales were hurt by the recession of the early 1990s, but Chanel recovered by the mid-1990s with further boutique expansion. 1990 saw the launch of Ä¹Å¹. As the business trend was going about (buying up other fashion companies), Chanelï¿½like Moï¿½t-Hennessy ï¿½ Louis Vuitton, Gucci and Prada -- bought up numerous companies. The House acquired Les Broderies Lemariï¿½, A. Michael et Cie, and Lesage. Chanel was also rumored to also buy the company Massaro. By 1996, Chanel bought gunmaker Holland & Holland. It attempted to revamp the guns maker but did not succeed. 1996 also greeted the launch of Allure fragrance and due to its immense popularity, a men's version, Allure Homme was launched in 1998. Better success came with the purchase of Eres (a swimwear label). The House of Chanel launched its first skin care line, PRï¿½CISION in 1999. That same year, Chanel launched a new travel collection, and under a license contract with Luxottica, introduced a line of sunglasses and eyeglass frames. While Alain Wertheimer remained chairman of Chanel, CEO and President Franï¿½oise Montenay was to bring Chanel into the 21st century. In 2001, Bell & Ross was purchased (a watchmaker). The same year, Chanel boutiques offering only selections of accessories were opened in the United States. 2002 saw the launch of Chance fragrance, with a scent of surprise and glamour. The House of Chanel also founded the Paraffection company that gathered the five Ateliers dï¿½Art: Desrues for ornamentation, Lemariï¿½ for feathers and camellias, Lesage for embroidery, Massaro for shoemaking, and Michel for millinery. A prï¿½t-ï¿½-porter collection proposing their know-how was designed by Karl Lagerfeld. It is now traditionally presented each December. In July 2002, a jewelry and watch flagship store was opened on the upscale Madison Avenue. Within months, a 1,000sqft shoes and handbags boutique was opened next door to the Jewelry and watches flagship. Chanel continued to expand in the United States and by December 2002, it operated 25 U.S. boutiques. In order to please the younger followers, Chanel introduced Coco Mademoiselle and an "In-Between Wear" in 2003. That same year saw such an immense popularity of Chanel haute couture that the company founded a second shop on rue Cambon. Continuing an influence in the Asian market, the House of Chanel opened a new 2,400 Square feet boutique in Hong Kong and paid nearly $50 million USD for a building in the classy and upscale shopping district of Ginza in Tokyo, Japan. Although Chanel borrowed many details from men's wear, her suits were never imitating men. Usually soft and untailored, made in jersey, velvet, silk charmeuse or tweed, these suits share the practical constants of boxy cardigan jackets with sleeve buttons that really button up, pockets where one needs pockets and straight knee-length skirts with walking pleats. Chanel disapproved of suits that could be worn only with the jacket closed so she designed jackets that looked good open, closed or draped over a shoulder. She made blouses which were an integral part of the ensemble, using fabrics matching the suit's lining, printed in corresponding colours or made in school-girl white with immaculate collar and cuffs. Women are dependent on this look even today. Chanelï¿½s ï¿½little black dressï¿½ was Deceptively simple, these dresses were wizardry's of cut and proportion. She used traditional elegant materials lace, tulle, embroideries, soft weightless silks - in a newly tailored way. Worn with a cardigan of the same fabric as the suit on the next hanger, the little black dress made women wearing anything else seem overdressed. Everyone whoï¿½s anyone. Seventies Chanel No. 5 spokesmodel Catherine Deneuve, current Chanel No. 5 spokesmodel Nicole Kidman, Natalie Portman, Jennifer Aniston, and Scarlett Johansson, and lots of Park Avenue ladies. Kirsten Dunst, Vanessa Paradis, Nicole Kidman.